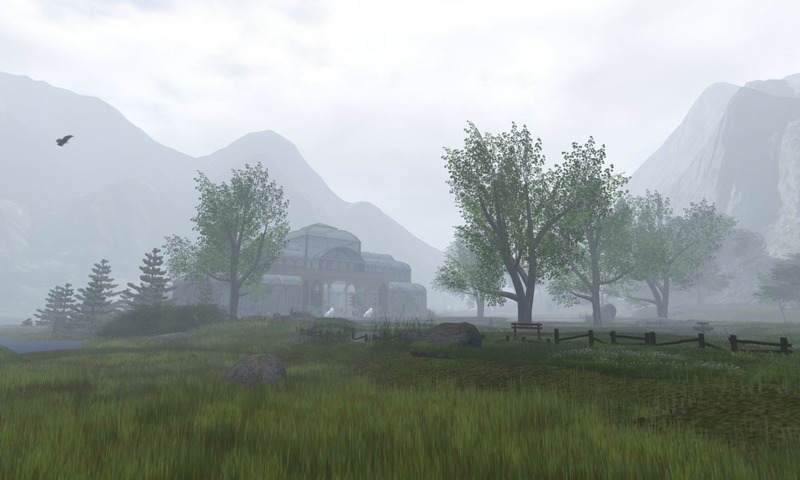 Remember “The Spring Glass Pavilion” that went up in the Spring of 2011 at 2500m above the Calas Galadhon sim? It was set in a valley and meadow…and the build’s landscaping was the size of a full sim…many thought it was indeed another of our sims. I miss the setting. It was a fun project to give it a ‘sense of place’ at that elevation.It was listed in the Destination Guide in the NATURE & PARKS category of the Destination Guide, until we took it down that Novemeber to make room…and prims…for all of the Christmas decorations below. We used it as our first Live Music Venue. We later modified the original building which had been given to us by our friend and builder Bora Rossini. Bora also built most of the Santorini build on Armenelos. We resurrected the pavilion in January of 2012 on the Bay of Belfalas sim almost twice as large…and referred to it as just “The Glass Pavilion,” and it became a favorite of many visitors.